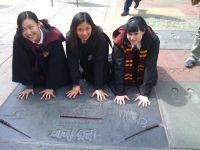 Home › Family › Aussie Girls in L.A.
After almost a week of attending the Terminus – Harry Potter Conference in Chicago, Illinois between 7-11 August 2008, these girls are still unable to hang their robes and wands. They just have to get their photos taken at the hand prints outside the GRAUMAN’S Chinese Theatre, Los Angeles. Photo taken 13 August 2008 by Jing Advincula (half of the dynamic duo of Elpie and Jing) their gracious hosts while in L.A.